To provide YOU the most affordable, quality and comprehensive portable shower trailer rentals. 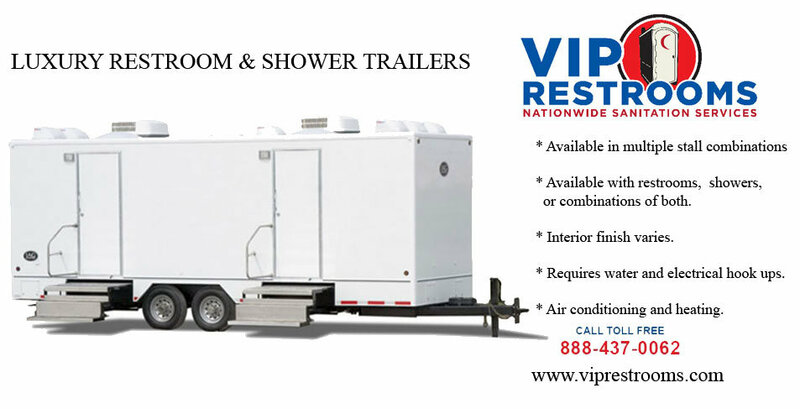 VIP Restrooms provides low cost portable shower trailers for rent. Get upscale mobile shower trailer rentals. Shower trailer rentals are great for many occasions. From weddings to outdoor concerts and much more. VIP Restrooms provides affordable shower trailer rental prices. Our team of leading professionals in the shower trailer and sanitation industry are on stand by. Whether you need a mobile shower trailer for your party, corporate event or festival. VIP has you cleaned & covered. Our shower trailer rentals are clean and efficient pieces of mobile equipment. We can get YOU the best mobile shower rental price available. Our team is ready to serve your showering needs. Mobile shower trailers are great for many event. Next time you are looking for a clean, low cost and Eco friendly mobile showering unit. Call VIP Restrooms for a free portable shower rental cost price!